Hot comet: Results of research from the Stardust comet particle retrieval mission are showing that the surface of comet Wild2 is composed of materials from the inner portions of our solar system. It used to be believed that comets were composed of matter from the outer regions of our solar system.What makes up a comet? Scientists are starting to find out as they dig into the samples of a comet collected through the recent Stardust space mission. And they’re finding out that a comet is made up a of lot more than space’s intergalactic dust bunnies, which used to be the original concept of comet formation.. Testing on the samples from the Comet Wild2 are showing that it is made up of hot particles from the inner solar system that drifted out to the colder ranges of the our solar system around Pluto’s orbit. Prior to these finding, astronomers thought that comets were made up from tiny, cold space particles from regions of space further out of our solar system that were drifting into our system. After doing the recent tests on Wild2’s comet dust, researchers are now estimated that around ten percent of a comet’s make up could have come from our inner solar system near the sun. 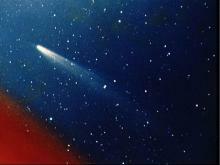 How those particles have ended up as part of a comet are still a mystery to researchers, however. It may be the result of the chaotic activity at the forming of the solar system when “hot” inner solar systems were blasted out into the outer reaches of space. And scientists are finding out that not all comets are created equal. Dust from Wild2 is very different from that of Tempel1, which was studied by NASA’s Deep Impact mission. On that mission, NASA last July crashed a probe into a comet and analyzed the dust and ice that spewed out from the crash. No surface materials were analyzed. With Wild2, the Stardust mission sent a capsule around the sun and then swooping past Wild2 to scrape up thousands of tiny samples of comet surface materials. That capsule returned to Earth in January for scientists to begin analyzing the make up of the comet’s surface. Some of the minerals found in the Wild2 dust are “high-temperature” minerals that were likely formed in the hottest portions of our solar system. Venus Express: Artist’s view of ESA's Venus Express probe in orbit around Venus. Image courtesy ESA - D. Ducros. Another planetary probe has achieved orbit around a planet in our solar system. Much like NASA’s Mars Reconnaissance Orbiter, the European Space Agency’s (ESA) Venus Express entered an elongated orbit of Venus yesterday. The probe will spend the next four weeks to refine its orbit from its current 9 day to a 24 hour polar orbit. The Venus Express was launched on November 9, 2005 and once it has reached its goal orbit will begin exploring the Venusian atmosphere. The probe will study the atmosphere’s complex dynamics and chemistry, as well as the relationship between the atmosphere and the planet’s surface, which will provide clues about surface characteristics. Vortex: Atmospheric vortex over Venus' North pole. Image courtesy ESA - AOES Medialab. One aspect of the Venusian atmosphere that Venus Express will investigate is the incredible atmospheric vortices that rotate over Venus’ poles. The vortex over the North Pole, has an unusual “double eye” configuration and its origin and impact on the planet continue to be a mystery. This will be the fourth ESA probe to achieve orbit around another celestial body. The ESA also operates the Mars Express (Mars), SMART-1 (the Moon), and is NASA’s partner on the Cassini-Huygens orbiter (Saturn). The ESA is also operating the Rosetta probe which is on its way to the comet 67P/Churyumov-Gerasimenko, which it will begin orbiting in 2014. The Mars Reconnaissance Orbiter (MRO) is scheduled to begin orbiting Mars on March 10th, seven months after leaving Earth on August 12, 2005. 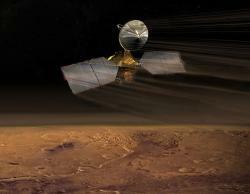 MRO Aerobreaking: Artist's concept of the Mars Reconnaissance Orbiter in its aerobraking stage. Image courtesy: NASA/JPL. Designed to study Mars in a low orbit, the MRO will have to make a tricky maneuver before the orbit is achieved. As the MRO approaches Mars, NASA expects to receive a signal around 3:24 Central time from the MRO indicating that it has turned its main thrusters forward and begun a 27-minute engine burn meant to slow the spacecraft down enough to allow Mars' gravity to capture it. The engine burn will end during a 30 minute window when the MRO is behind Mars and out of radio contact, so controllers will have some time to sit and worry. And there is good reason to worry. Past NASA missions sent to orbit Mars have had only a 65% success rate. If the engine burn is successful the MRO will be in a very elliptical 35-hour orbit. In order to get the MRO into the desired circular 2-hour low orbit it will continue to use Mars' atmosphere to slow it down. This process, called aerobraking, is also very tricky as Mars' atmosphere is unstable and can swell unpredictably. Current Mars orbiters in higher orbits will monitor the atmosphere to help keep the MRO at a safe and effective orbit. Once the desired orbit is achieved, scientific operations can begin. The MRO carries six scientific instruments on board that are designed to collect more data than all of the previous Mars orbiters combined. Information on the weather, radar images of the surface and sub-surface, water sensors, and color images of the surface will be gathered to increase our overall understanding of Mars, as well as to help NASA select future landing sites for unmanned, and possibly manned, missions to the surface. The MRO is also designed to relay information from planned missions to the surface of the planet as well, including the Phoenix Mars Scout (set to land near the polar ice cap in 2008) and the Mars Science Laboratory (scheduled for launch in 2009). A podcast about the mission is available from NASA. You can also check out where the MRO is now, check out a Quicktime movie about the process of just getting the MRO to this point, and more at the MRO page. Scientists using the Samuel Oschin Telescope at Palomar Observatory have discovered what they call a planet larger than Pluto in the far reaches of our solar system. The planet, currently called 2003 UB313, is a trans-Neptunian object which means all or most if its orbit is beyond that of Neptune. The planet is a member of the Kuiper belt, which also claims Pluto and its satellite Charon as members. A name for the new planet has been proposed by the scientists to the International Astronomical Union, but has not yet been approved until the IAU can determine the minimum size requirement for a planet. Do you think 2003 UB313 is a planet? What would you name the 10th planet? 2. Have sufficient mass so that it assumes a nearly round shape. 3. And have sufficient mass to have "cleared the neighborhood around its orbit". Pluto has not cleared the neighborhood of its orbit of Kuiper Belt Objects, so it is no longer considered a planet. After being stuck in a sand ripple for the past five weeks, the Mars Rover Opportunity was finally able to free itself. Opportunity became stuck on April 26 on the way to study an impact crater. Now that it is free, Opportunity will take a closer look at the area it became stuck in to determine what made the sand ripple it was stuck in any different from the dozens of others it had driven over in the past with no incidence. Hopefully this will enable the rover to avoid being stuck again. Meanwhile Spirit, Opportunity's twin, captured several images of dust devils as they cross the surface of a crater. Opportunity and Spirit, have been exploring the Mars surface for over a year, far longer than the three month mission that was originally planned.